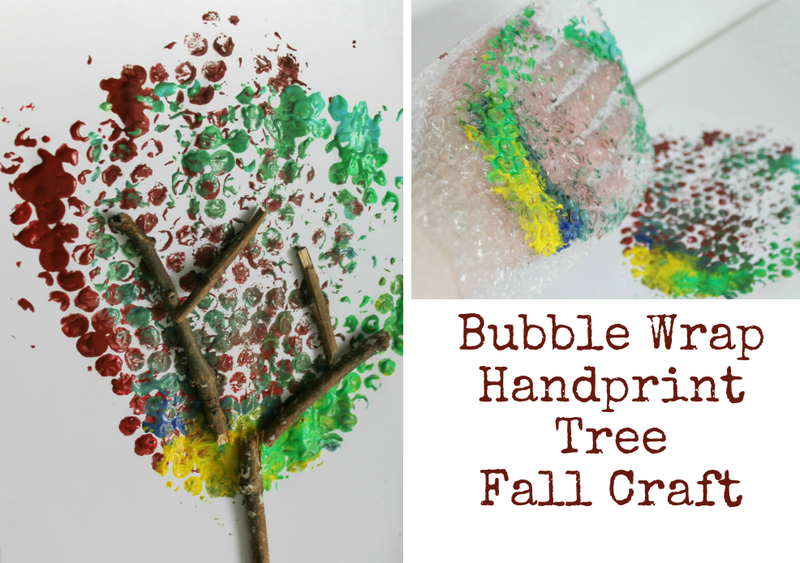 This bubble wrap handprint tree was a very easy project to make and lots of fun. You can adapt the colours for any time of year, so that the tree matches the seasons. 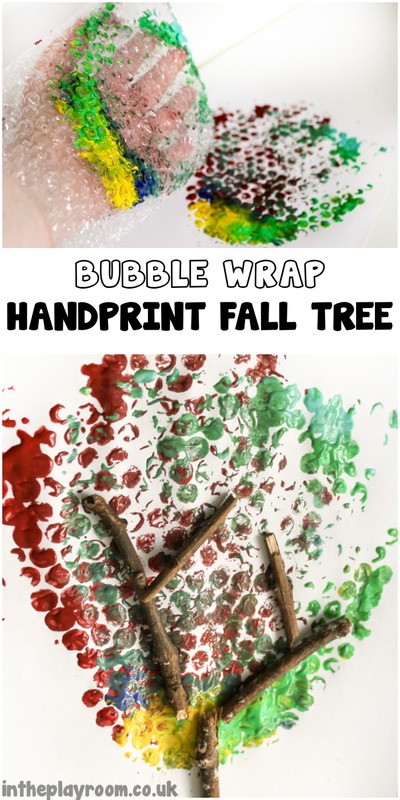 Since it’s Autumn right now we used Autumn and Fall colours to make our bubble wrap handprint tree into an Autumn one. Whenever we get packing materials that look like they could come in handy for arts and crafts, I always tend to store them away ready for a future crafting session. I had some bubble wrap that came in little pouches rather than just a sheet, and luckily they were just about hand-sized, so perfect for making a bubble wrap mitten to use for painting! 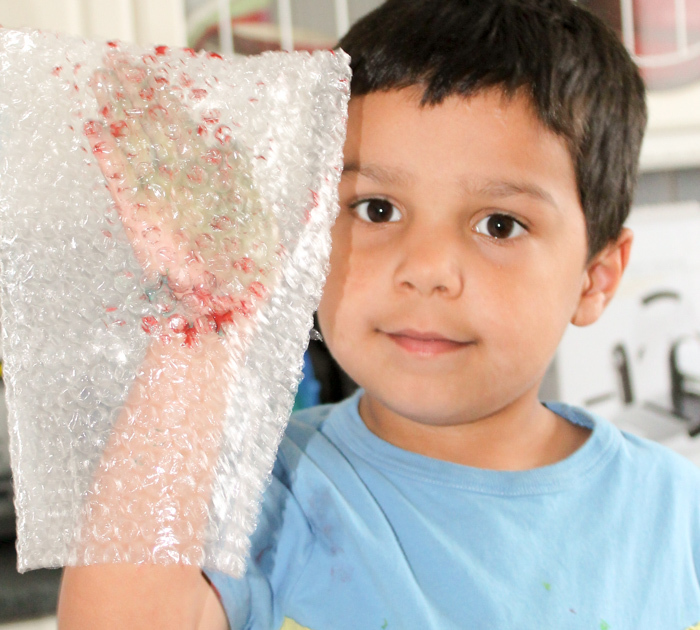 If you have a sheet of bubble wrap you could easily create the same thing by using some tape to create the pouch shape. We mixed some colours on a paper plate, one with greens and yellows and one that was a little more browny (I can’t find a picture of this brown one). Mr T loved mixing the colours and swirling them around all together. 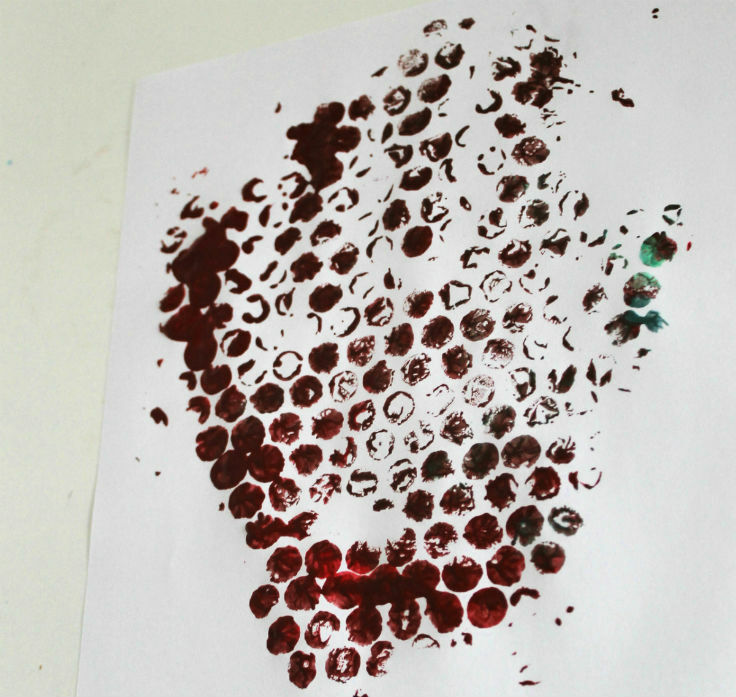 You then place your bubble wrap mitt covered hand into the paint and make a print! If you want to use the other colour, just turn your hand over and print with the other side! We layered both colours to make our Autumn tree shape. Once our shape was ready, we decorated with twigs to finish off the Autumn tree effect. If you want to glue the twigs down, then wait until the paint is dry and glue with PVA / white glue / school glue. 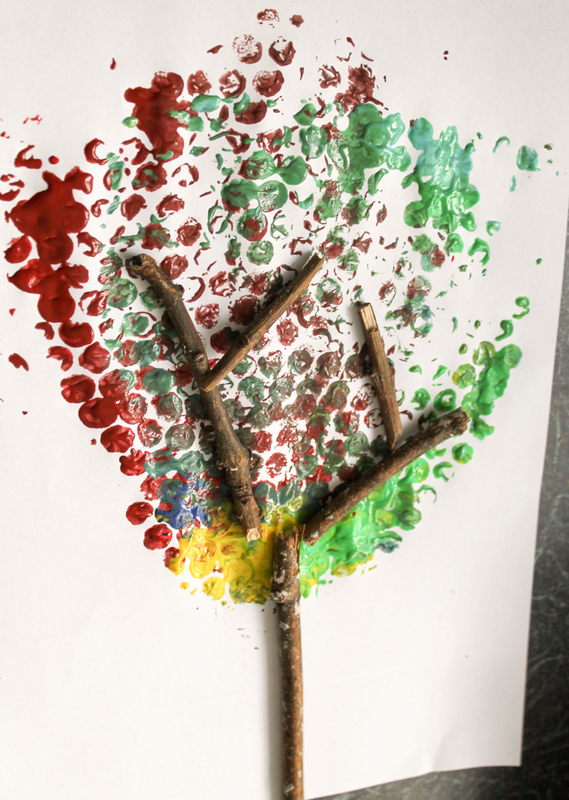 You can also leave them loose then the children can play with moving them around and changing the shape and design of the tree once the paint is dry. 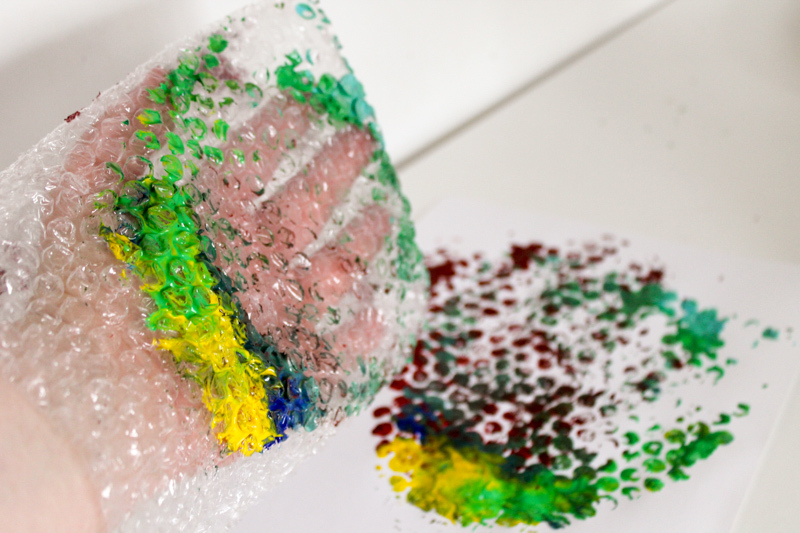 These bubble wrap mitt paintings are a great way to play with hand prints with less mess. 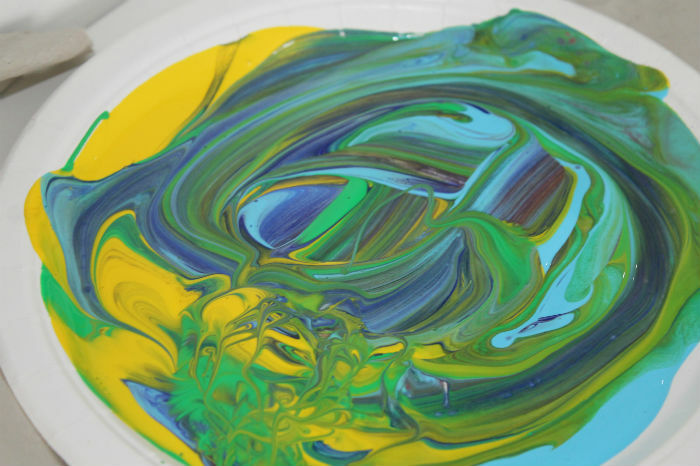 They might also be a good option for children who don’t like to get their hands right in the paint, due to sensory issues. For all children, they’re a fun way to explore texture and to make use of unwanted packing materials rather than just throwing them in the bin! I’m sure we’ll make more of these bubble wrap trees for the other seasons. Pink paint to make a bubble wrap textured blossom tree would be so pretty in Spring! Why not try some of these ideas too! Gorgeous! This looks like a nice simple after-school project for my two. Such a cute idea! I’ll have to try it with my two! What a great idea – I think we might decorate one wall in my daughters bedroom using this in neon pink and white on a light pink background- what do you think? Great idea, I hadn’t came across this before. Great to be creative and resourceful. Love this, will be using at work and home! What a great idea. My son doesn’t really like getting his hands dirty so this would be perfect for him! What a fun autumn craft project for kids!